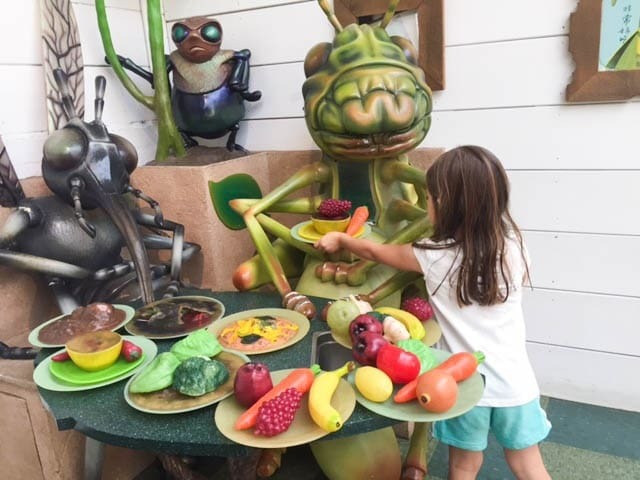 Kidspace Children’s Museum is one of the best children’s museums in Southern California and recently made our top list of 40 LA Museums to Explore with Kids. The name says it all…Kidspace is designed just for kids. Each space within the museum provides opportunities for hands-on learning and interactive play. Children are encouraged to jump right in as soon as they arrive and lead the way. Flashy electronic displays are nowhere to be found, but that’s what makes Kidspace such a unique learning place for children. 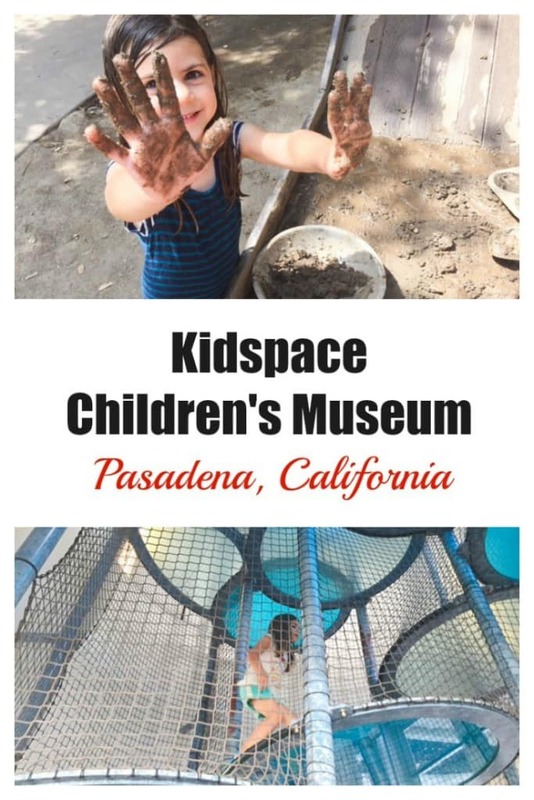 A day at Kidspace is a walk down memory lane for me with the outdoor play spaces, nature inspired exhibits and simple activities with water, rocks, and mud. 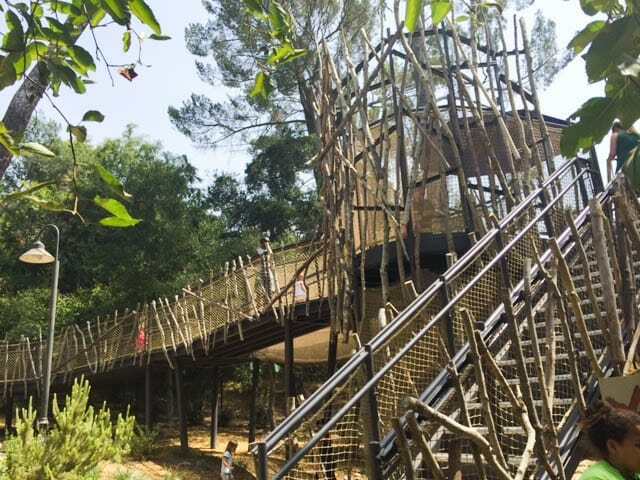 A new addition to Kidspace this year is Arroyo Adventure – an area that features 8 interactive outdoor exhibits that connect children with nature. 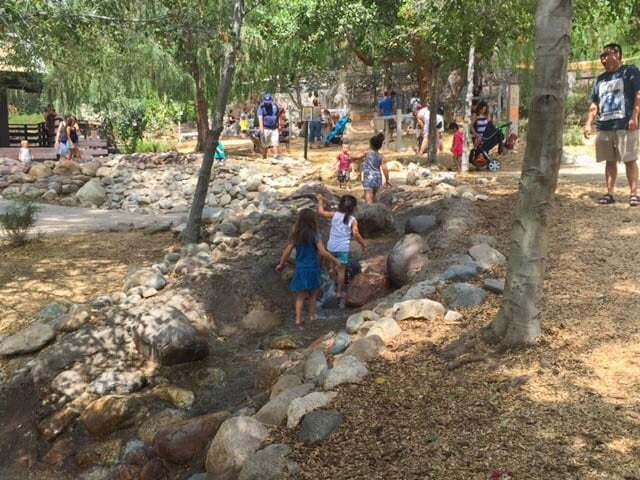 It’s a kid’s paradise complete with water play, clay molding tables and bridge climbs above the Arroyo Seco themed area. During our visit, my daughter and her best friend became explorers navigating their way up rocks, through a stream and getting their hands dirty making “mud cupcakes.” Along the way, my daughter made new playmates who shared her love of water and dirt! The stream is also a perfect place for adults to rest a bit under the shade of trees or in my case a perfectly shaded bench. 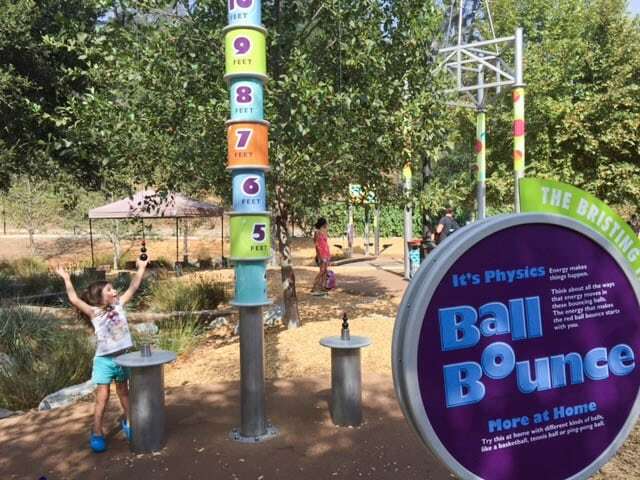 Galvin Physics Forest is an outdoor arena with science based games, including my daughter’s favorite Ball Bounce. Giant lever pulls, cool fans and bottle rockets are just a few of the activities that she enjoyed. Make sure to read the instruction boards for each game though to make sure you’re following the proper steps. Each game will challenge your mind and body! If you and your kids need to escape the heat, there is plenty to explore in Roberts Pavilion inside. 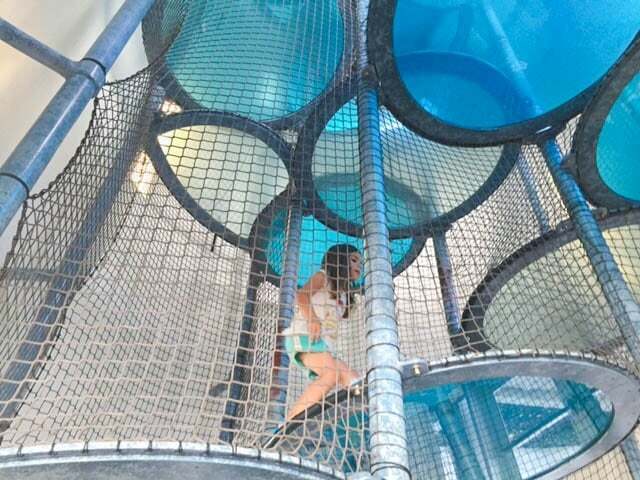 Climbing towers invite children and adults to ascend more than forty feet to view the entire Kidspace museum. My daughter was a bit hesitant to navigate the levels on her own, so I joined her for the first half. I must admit I had a blast! However, I was sad to hear that our favorite indoor exhibit, Bugsy’s Diner, is closing in September. This is a great exhibit for children of all ages. My daughter takes role playing very seriously especially when she’s in charge of the diner. She loves to serve up the food and tell me all about the veggies and fruit options available in her diner. Kidspace Children’s Museum also has an Early Childhood Learning Center for children 3 years old and under where they can play with sensory learning games and toys. Extra clothes are needed if your child decides to explore the Arroyo Adventures area. Bring sunscreen and water bottles as several of the activities are located outside and the afternoon sun can be very intense in Pasadena. Refillable water stations are located in the outside café area. Kidspace staff are available in each exhibit to answer questions and offer assistance when needed. The first Tuesday of every month from 4:00 to 8:00 pm is Kidspace’s Free Family Night! Admission to the Museum is FREE for everyone during these hours only. Families can engage with special programming and performers that highlight cultures and traditions from around the world. Kidspace Children’s Museum Homeschool Days take place once in the fall and in the spring. 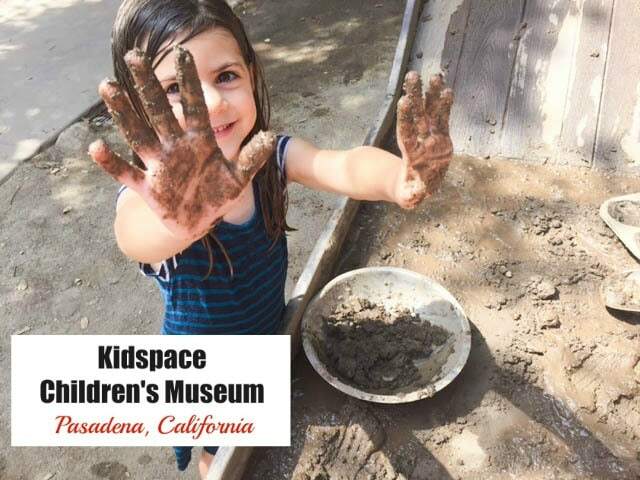 The next Homeschool Day at Kidspace Children’s Museum in Pasadena is set for Wednesday, October 10. For $15 per student, enjoy admission to the museum and a 45 minute Discovery Program. This fall, Homeschool Day is all about Adventures in Art. Students are invited to explore the connections between rhythm and expression using nature and movement through music and art. 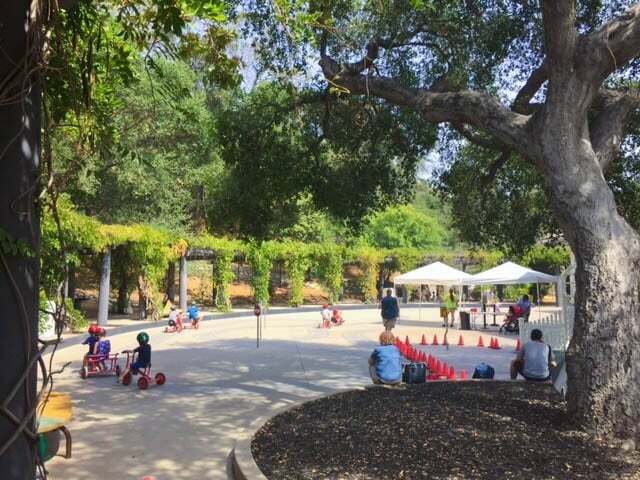 The $15 rate provides general admission for both 1 adult and 1 child and the option to participate in the Amphitheater Discovery Program at 1:00 pm. You much register online to receive this discounted rate. Additonal adults and non-participating siblings are an additional $10 each. No minimum number of students is required to sign up and one adult must be present for every 5 students registered. To learn more about Kidspace Homeschool Days, visit HERE. Kidspace Children’s Museum is located at 480 North Arroyo Blvd. in Pasadena, CA. Admission is $13 for adults and children. Liz is an avid beach goer and blogger at Urban Beach Baby where she shares adventures and tips for creating a family-oriented urban beach lifestyle. Join her as she explores LA to find the best kid-friendly gems in and around the area!